A bounty of chocolate delights from XT Patisserie. All photography by Corey Lugg | THE NIBBLE. This is Page 6 of a six-page article. Click on the black links below to visit other pages. Xuan Ngo was born in Vietnam, grew up in France and has worked for some of the most prestigious patisseries and chocolatiers, from Pâtisserie Lenôtre in Paris to restaurant Daniel in New York, where he learned the art of making fine chocolates under pastry chef François Payard (now proprietor of Pâtisserie Payard). But none of that renders his chocolates worth eating. What does is his ability to balance flavors, textures and even garnishes; everything is about getting the proportions right. His Kalamansi piece, which will surprise you with the tartness of its filling, is made from the puree of a Southeast Asian lime blended with a white chocolate ganache, enrobed in white chocolate. The pretty Caramel Vanilla Fleur de Sel is a half-hemisphere of milk chocolate, with a beautifully-textured caramel interior. You’ll taste the fleur de sel, but it’s not too forward or too retiring. Similarly, the dark-couverture Vanilla has a wonderful aftertaste and slight crunch, both reminding you of the taste and texture of the seeds of that wonderful orchid. It’s easy to see that the ingredients used are first-class, another example of Ngo’s devotion to his craft. 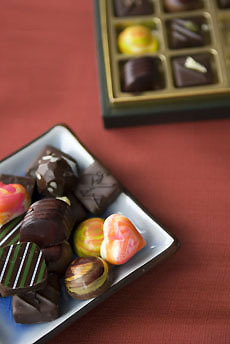 There are a dozen different choices on the website; a box will get you a taste of each. 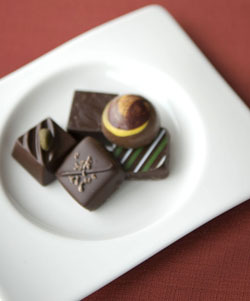 Or if you have a particular passion—Earl Grey Tea, Ginger, Passion Fruit Caramel—you can order them by the dozen. 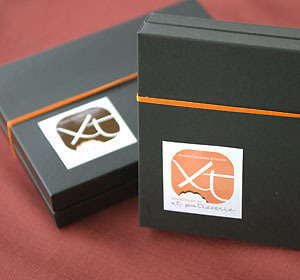 As of this writing, the business is transitioning from the name Xuan Patisserie to the name XT Patisserie. There is no retail store, but there is online ordering. Above, clockwise from top: Vanilla, Caramel & Passion Fruit, Green Tea, Coffee, Pistachio.